A configuration management service that helps you configure and operate applications in a cloud enterprise by using Puppet or Chef. AWS OpsWorks Stacks and AWS OpsWorks for Chef Automate let you use Chef cookbooks and solutions for configuration management, while OpsWorks for Puppet Enterprise lets you configure a Puppet Enterprise master server in AWS. Provides a fully-managed Puppet master, a suite of automation tools that enable you to inspect, deliver, operate, and future-proof your applications, and access to a user interface that lets you view information about your nodes and Puppet activities. Does not support all regions. AWS manages the Puppet master server running on an EC2 instance. You retain control over the underlying resources running your Puppet master. You can choose the weekly maintenance window during which OpsWorks for Puppet Enterprise will automatically install updates. Monitors the health of your Puppet master during update windows and automatically rolls back changes if issues are detected. You can configure automatic backups for your Puppet master and store them in an S3 bucket in your account. You can register new nodes to your Puppet master by inserting a user-data script, provided in the OpsWorks for Puppet Enterprise StarterKit, into your Auto Scaling groups. Deleting a server also deletes its events, logs, and any modules that were stored on the server. Supporting resources are also deleted, along with all automated backups. You are charged based on the number of nodes (servers running the Puppet agent) connected to your Puppet master and the time those nodes are running on an hourly rate, and you also pay for the underlying EC2 instance running your Puppet master. Lets you create AWS-managed Chef servers that include Chef Automate premium features, and use the Chef DK and other Chef tooling to manage them. You can use Chef to manage both Amazon EC2 instances and on-premises servers running Linux or Windows. You receive the full Chef Automate platform which includes premium features that you can use with Chef server, like Chef Workflow, Chef Visibility, and Chef Compliance. You provision a managed Chef server running on an EC2 instance in your account. You retain control over the underlying resources running your Chef server and you can use Knife to SSH into your Chef server instance at any time. You can set a weekly maintenance window during which OpsWorks for Chef Automate will automatically install updates. You can configure automatic backups for your Chef server and is stored in an S3 bucket. You can register new nodes to your Chef server by inserting user-data code snippets provided by OpsWorks for Chef Automate into your Auto Scaling groups. Deleting a server also deletes its events, logs, and any cookbooks that were stored on the server. Supporting resources are deleted also, along with all automated backups. You are charged based on the number of nodes connected to your Chef server and the time those nodes are running, and you also pay for the underlying EC2 instance running your Chef server. Provides a simple and flexible way to create and manage stacks and applications. Stacks are group of AWS resources that constitute an full-stack application. By default, you can create up to 40 Stacks, and each stack can hold up to 40 layers, 40 instances, and 40 apps. You can create stacks that help you manage cloud resources in specialized groups called layers. A layer represents a set of EC2 instances that serve a particular purpose, such as serving applications or hosting a database server. Layers depend on Chef recipes to handle tasks such as installing packages on instances, deploying apps, and running scripts. OpsWorks Stacks does NOT require or create Chef servers. You can deploy EC2 instances from template configurations, including EBS volume creation. You can configure the software on your instances on-demand or automatically based on lifecycle events, from bootstrapping the base OS image into a working server to modifying running services to reflect changes. OpsWorks Stacks can auto heal your stack. If an instance fails in your stack, OpsWorks Stacks can replace it with a new one. You can adapt the number of running instances to match your load, with time-based or load-based auto scaling. You can use OpsWorks Stacks to configure and manage both Linux and Windows EC2 instances. 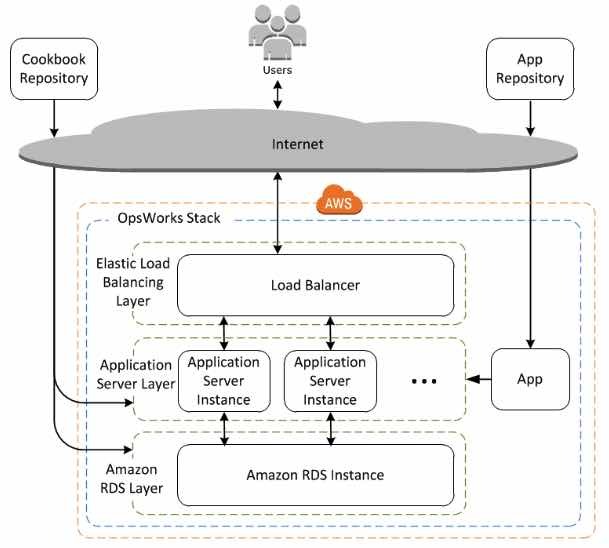 You can use AWS OpsWorks Stacks to deploy, manage, and scale your application on any Linux server such as EC2 instances or servers running in your own data center. Time-based instances are run by OpsWorks Stacks on a specified daily and weekly schedule. They allow your stack to automatically adjust the number of instances to accommodate predictable usage patterns. Load-based instances are automatically started and stopped by OpsWorks Stacks, based on specified load metrics, such as CPU utilization. They allow your stack to automatically adjust the number of instances to accommodate variations in incoming traffic. Load-based instances are available only for Linux-based stacks. Configure occurs on all of the stack’s instances when an instance enters or leaves the online state. OpsWorks Stacks sends all of your resource metrics to CloudWatch. Logs are available for each action performed on your instances. CloudTrail logs all API calls made to OpsWorks. Grant IAM users access to specific stacks, making management of multi-user environments easier. You can also set user-specific permissions for actions on each stack, allowing you to decide who can deploy new application versions or create new resources. Each EC2 instance has one or more associated security groups that govern the instance’s network traffic. A security group has one or more rules, each of which specifies a particular category of allowed traffic. You pay for AWS resources created using OpsWorks Stacks in the same manner as if you created them manually.